PON Tails: short or docked ? It is well known that naturally short tails used to be a typical feature of pons; some of the very first descriptions actually relate to short-tailed dogs. Dogs, bred in pre-war years in Planta and Milanow, were all bobtails and this feature is stressed in their description by the late Mrs Zoltowska, one of the pre-war breeders. 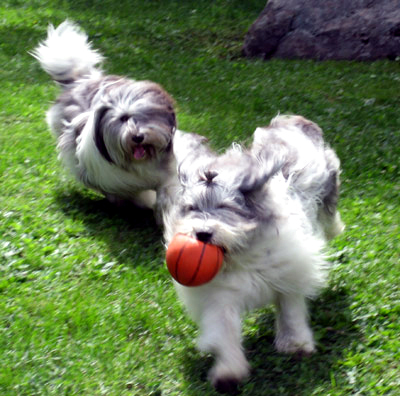 When the famous Kordegarda kennel of pons was established in the 50’, most of the foundation stock were natural bobtails. In those years, however, tail docking was considered an obvious procedure; therefore breeders didn’t select deliberately for this feature, and they did not keep any records of tail lengths at birth. Yet it’s known for sure that the two great sires of utmost influence on establishing the modern pon – SMOK z Kordegardy and DOMAN z Kordegardy - were both natural bobtails. 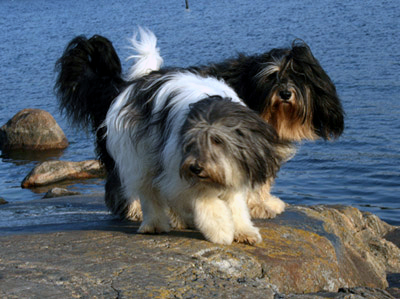 As the docking ban seems to be spreading, it’s important to decide about future breeding strategies: are we going to breed one more shaggy coated, medium sized dog, OR are we to preserve its unique feature – the short tail (mind, there is no other breed of similar type that has short tail, so pons are unique in this respect!). Doubtlessly, this unique feature still exists with the breed and can be successfully bred for. But, first of all, we have to know what is its genetic background, how it is inherited, and whether breeding for short tails increases risk of any possibly linked defects. Originally, it was thought that short tails was a simple Mendelian trait (QUALITATIVE), most probably a dominant one. Indeed, there is a vast evidence that bobtail puppies are born only when one of the parents is a bobtail. From this point of view, short tail can be inherited just in the same way as coat colour (e.g. black or brown) or its type (short or long). Unfortunately, the inheritance of short tails must be far more complex. It is well known that so-called "tural bobtails” come with tails of DIFFERENT length and shape. Given sufficient number of progeny, we will be able to see tails varying from very short, hardly noticeable ones, through different lengths up to full length– in fact, almost an unbroken continuum. When presented in a graph, these results form a typical curve, known as Gauss curve. This is typical of QUANTITATIVE traits of more complex inheritance. They are encoded by large number of genes. Any quantitative trait is measurable, highly variable and rather difficult to fix. Some examples of quantitative traits are height at withers, coat texture and fertility. If the above is true (and there is no strong evidence against!) we must accept that in any litter of natural bobtails there are pups with tails of different length. From my own experience with Pembroke welsh corgis I find that it depends, at least to some extend, on the length of parents’ tails. The shorter they are, the more real "bobtails” in the litter. One of my studs who is a very short "bobtail” produced mostly short bobtails, whereas the other, whose tail is some 6 cms long, produced pups with only partially shortened tails. This is perfectly in agreement with the hypothetical mode of inheritance. One must admit, though, that these partially shortened tails are not very attractive! Additionally, it will be very difficult to breed only short tails, although long termed selection may highly increase this probability. Pembroke breeders are far more advanced in their attempts than pon breeders and it worthy to note that in Norway, in just a few generations, they have gained a double increase in numbers of bobtails bred.